Hold the Menu and Previous buttons for 6 seconds. You should see a new graphic appear, a remote and a broken chain.Then, Hold the Menu and Next buttons for 6 seconds. The graphic will go away, as you have just "paired" your remote with your Apple TV. I got a new external hard drive to use for backups. Before starting, I wanted to format the drive as NTFS, instead of the default FAT32. When I tried though, the system always gave me an error message,"volume is in use by another process." Of course I checked and checked, and was certain nothing else was using the drive. It turns out that the drive when initial setup was added to the System Restore Monitoring; I needed to remove it to format the drive. Go to Start >> All Programs >> Accessories >> System Tools >> System RestoreClick the System Restore Settings in the right paneHighlight the driveClick SettingsCheck "Turn off System Restore" on this driveClick OKClick OK againClick Cancel (to close the Welcome to System Restore dialog)For a drive that I am using as a backup drive (a data only drive), there is no reason to use System restore, so after formatting, I did not re-enable. Searched for "upconverting DVD players"Sort by price: low to highFirst thing I get is a bunch of cablesChange search to "upconverting DVD players -cables"Sort by price: low to highNow the first results are the low-end upconverting DVD playersYou can also add multiple items to exclude. For example: "upconverting DVD players -cables -progressive". Forbes reports on recent work that has identified many airport hotspots not being secure. This is a good reminder to all of us who use hotspots that we need extra security. First, if you can get on the hotspot, so can anyone else. With a little work and help from programs such as Cane and Abel, anyone can intercept everything you send and receive. Other people may just set up their laptop to look like a hotspot, so when you connect, you are actually connecting to their laptop. Again programs are readily available to make this work with relative ease. Your job, if you're going to use hotspots, is to only communicate with VPN on. VPN will encrypt data as it is sent and received between your laptop and the VPN server. If your company does not provide you with VPN or you need it for private use, try services such as PublicVPN or HotSpotVPN. For a small fee, these services will protect you . You're keeping up with Microsoft updates, aren't you? 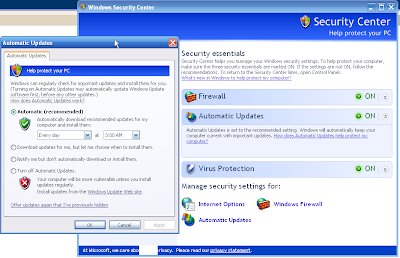 Ars technica reported yesterday that a recent Microsoft update, with its Malicious Software Removal Tool (MSRT), removed nearly 1 million fake anti-virus programs from users' machines. This is a good reminder to us all -- make sure you're keeping up with the Microsoft patches, which are typically released the second Tuesday of every month. Unless you're technically astute enough to critically review each and every patch, I would recommend you set it for auto-update. Here's how to do it. Excel provides an easy formula to set text values in cells to the correct or proper case. This is very helpful when cleaning up data before entering into a database. If the source was from a third-party -- perhaps from user registrations, it's not unusual to have users not capitalize proper names. =PROPER(A1) where A1 is the cell of the value you want to convertIf you are going to reference the value later, remember you can use the Text command too. =TEXT(PROPER(A1),"#")If you want to convert the entire value to upper case, use the UPPER function. 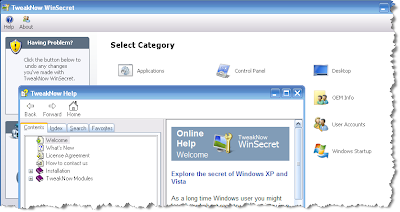 ApplicationsControl PanelDesktopMiscellaneousNetwork & InternetOEM InfoSpecial FolderStart MenuUser AccountsWindows CoreWindows ExplorerWindows StartupHere are just a few of the many tweaks you can make. If you're not familiar with Twitter, it is a micro-blogging tool, where users can only post 140 characters at a time. The low character count was determined based on the ability of phones to SMS, with caps ranging from 140 to 165 characters per SMS message. As a Twitterer, you can post information on what your doing, a new website you found, or short news blurbs. Other people can follow you on Twitter, and see your posts as you make them. The "goodness" I am referring to is the use of Twitter by the AMBER Alert system. Sign up as a follower of amberalert and get informed of any new AMBER Alerts. I'm actually quite surprised amberalert doesn't have more followers -- less than 500. According to TwitDir, President-Elect Barack Obama (BarackObama), the leader with the most followers, has 133,482 followers. Couldn't get at least 5% of those followers to follow amberalert? UPDATE 18-Nov-08: I missed this one; not sure what changed -- Google Docs DOES NOT allow sharing of PDFs. Of course a single user can store and view a PDF; you just cannot share it. "Please note, at this time you can only share PDFs from the Docs list, not the PDF itself. Publishing a PDF so that anyone can view has not yet been implemented." I guess I am back to finding an alternative.I looked into free file hosting, to see if I could find a place to store a few PDFs for this blog. The real need came from my current host, Blogger, not providing this service when I last checked in August. It is free, so I can't really complain, yet it is part of Google that gives me 10 GBs free for using their Gmail and Picasa services -- that are also free. Of course I could use Google Docs, but then that forces me to format my documents to fit their tool. I reviewed two different product key utilities, with the purpose of keeping a backup of all my product keys in case I ever need to reinstall my applications. 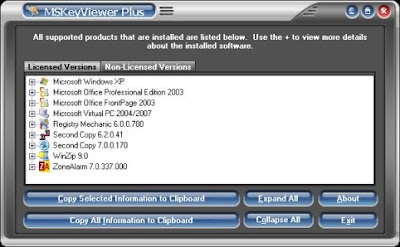 The programs I tried were Product Key Finder and MSKeyViewerPlus. I tried MSKeyViewerPlus and immediately liked it. It separated those applications that required keys and those that did not (free). With a single click I was able to expand the window to view all the key information, and with another click I had them all copied to the clipboard. MSKeyViewerPlus was created by a guy named Todd (couldn't find his last name) and he makes it available off of his family website for free. I found on the Discovery website, originating from The Futurist magazine, the Top 10 Forecasts for 2009 and Beyond. Here's an exert and some opinion. Everything you say and do will be recorded by 2030. Here's some facts: Our ISPs can (and some do) record every movement we make on the Internet (including email); Google is everywhere and capturing everything; our employers are tracking our network and email usage; and we're already capturing and documenting our lives through social networks and photo & video sites. On top of that, places like London have cameras on every corner and are recording every phone call too. It is just a matter of time before everything is recorded -- I wouldn't be surprised if this becomes a reality as soon as 2020. I just got back from Dreamforce '08, Salesforce.com's annual user and developer conference (see Keynotes here). I've been a Salesforce.com user and administrator for about 6 months, so this was my first Dreamforce. I came away impressed and excited about the Salesforce.com platform. Cloud computing has been a recent buzz word, and we have heard it in context of Google, Amazon, and recently from Microsoft. What I saw from Salesforce.com though was the first real example of what cloud computing can offer. I just learned about TripIt last night, as I was discussing an upcoming conference with a friend. this is a website that I am excited about, even though my travel has dwindled considerably. TripIt is an easy to use trip organizer. The Internet has made it easier than ever to plan trips, make reservations, and send friends and family information about that trip. Until TripIt, though, you still had to keep every booking, every plan, and every detail in its own format scatter over the Internet, in your email box, and on printouts. With TripIt, you can enter all the data into one place, and build an itinerary that can be accessed from anywhere; an itinerary that can be shared with friends and family; and an itinerary that you can print and have all in one easy to read format. Activate Wi-Fi from the settings icon on your iPhone Select "attwifi" from the list of available networks Enter your 10-digit mobile number and check the box to agree to the Acceptable Use Policy.Tap 'continue' You will receive a text message from AT&T with a secure link to the AT&T Wi-Fi hotspot. You will not be charged for the text message. The SMS link will only be valid for 24 hours at the location it was requested. Another request must be submitted when using another hotspot location. Open the text message and tap on the link for 24-hour access to the AT&T Wi-Fi hotspot.Enjoy!Credit for the documented steps goes to my great colleagues at work. Find a design template you likePrint itWrite your letter (on the back)Fold per the printed guidesAddressAdd a stampMailIf Letterfu intrigued you, then you might find one of these other paper folding sites of interest. Paperfolding.com is all about origami, from the history to easy lessons to complex origami art.A Paper Folding Project contains instructions for a single design from Paul Haeberli.Folds.net has a collection of links (some broken) to folding instructions for various origami.So give Letterfu and letter writing a try. Perhaps letter writing isn't quite dead, yet. In March I wrote about programs that can improve your alt-tab behavior in Windows. 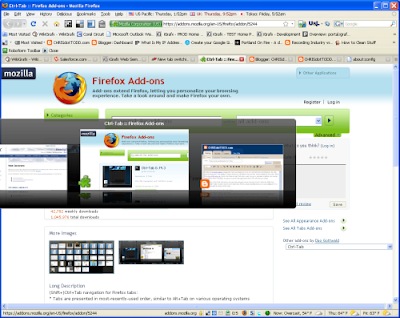 In this 300th blog post, I'm going to share with you a Firefox add-on that works similarly for tabs. With the Ctrl-Tab add-on, press the Control and Tab keys, and you get a preview window of current and other tabs. Continue to press to scroll through and select the tab of your choice. By default, Ctrl-Tab will order the previews based on last viewed. Use it with the Shift key (Ctrl-Shift-Tab) to move in reverse direction. 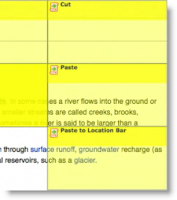 With a small modification, you can configure it to scroll through in order of the tabs. 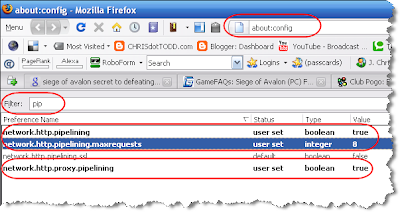 Open a new tabEnter about:configSearch for browser.ctrlTab.mostRecentlyUsedChange the setting from True to False (double-click on True)Restart your browserJust one more usability improvement to making web browsing a little easier. 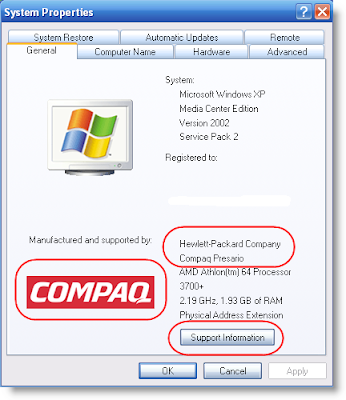 For most of us, we bought our XP computer from a vendor who customized the display of the Systems Properties General tab (Control Panel >> System Properties). Microsoft has made it easy to put your own custom logo and Support Information on this tab. Line2="for basic Windows XP questions." Line3="Please refer to the Warranty and Support Guide"
Line4="for complete support information in your country." Line7 = "In the United States, call 1-800-652-6672. " Line9 = "Support is available 24 hours per day,"
The Internet is flooded with websites, more bad than good. Just the shear number of sites, even if they were all good, makes it difficult to find those sites that are relevant to you right now. With that in mind, I thought I would share some websites that I recently found, that I believe fall into the "good" category. Day-to-day the articles on this site do not typically go together, which is the power of this site. It exposes you to new things all the time. Take for example the article from October 16, 2008 -- it's about 28 different free file storage websites. The article on the 15th of October has 78 ways small businesses can save money. Quite diverse, both offer value. NirSoft has countless software utilities from password tools, to network tools, to browser tools. Definately a site for geeks. As you may recall I wrote in September about the latest company to drop DRM, Walmart. I think we all agree that dropping DRM is a good thing, but in Walmart's case, as with Microsoft and Yahoo before them, they were also planning to turn-off their DRM servers, punishing those who bought the DRM'd music through their online store. Again like Microsoft and Yahoo before them, Walmart had a change of heart and has decided to leave their DRM servers running, at least for now. So this is a good thing. At least for Microsoft, Yahoo, and Walmart they have owned up to their mistake and they are not penalizing their customers, who supported them during their DRM mistake, any further. For those companies that are still pushing and supporting DRM, heres a short comic of the greater problem they are causing. They're putting their own customers between a rock and a hard place. I ask, "Why would you do this to people who have interest in your products?" What would it be like if your life was like Facebook or another social network? You might find acquaintances from long ago showing up at your door. This first video helps you see what that might be like. The first video is from some blokes in England, Idots of Ants -- they are Benjamin Wilson, James Wrighton, Elliott Tiney and Andrew Spiers. This is just one of many videos available on YouTube by the Idiots. If you have a tech job, many others likely do not understand what you do. Of course you spend most of the day playing computer games. And when your non-technical colleagues have technical problems, they are all the same problem, caused by the same thing, requiring the same fix. In this case, it's because the website is down. I hope you enjoyed these video shorts as much as I did. I found a great, free site that will take my mp3 music and create ringtones. With audiko.net you can search for existing ringtones, upload your own mp3 or enter a URL of an mp3 or YouTube video. The ringtones should work with most phones including the iPhone. When you upload a file, it takes only a few minutes to process, and then you can select the music segment that you want converted to a ringtone. The one problem with the entire process is that you cannot play your uploaded file, so you need to determine on your computer or mp3 player the time mark to start and stop the clip. Audiko.net is able to process files so quickly because they only use the first 75 seconds of a clip, which should be fine in most cases. Though the ignoring of extra password characters is still true, you have to exceed 14 characters before you see this behavior. A 14 character password is sufficiently long enough where this should not be a significant issue.The reason behind the case insensitive username and password is so the same system can support phone interaction as well. Though this lowers the security level, it is compensated for by limiting failed logins to 3 attempts. After the 3rd failure, the user must contact the bank before they can try again. popd zThis is a great solution for those batch files that require a drive mapping, but you do not want to keep the mapping alive all the time. Most of us who have purchased iTunes music know that we can remove the DRM from the M4P audio files by burning the music onto a CD. But if you have a large collection, this can be very time consuming -- though having your music backed up to CD isn't a bad idea. For those of you who do not relish the idea of bacing up each every track, there might be a solution available for you. Many applications we use come with built in spell checkers; with F7 being the most common way to execute the spell checker. With more and more web based apps, I seem to find myself occasionally not having a spell checker or the spell checker is cumbersome. For me, this no longer is a problem. 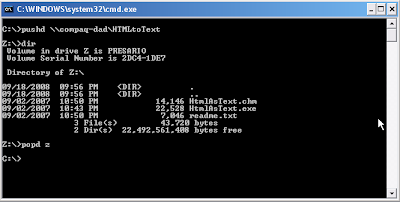 I ran across a great article on Royal HeHe2-ness from guest blogger Ian McLean about DRM and why it needs to go. Why Its Time To Kick DRM To The Curb give a good perspective on the options for digital media companies and consumers. Mr. McLean re-enforces the fact that honest folks are impacted, while the less honest have a better product. Further he also points out that in many cases there are free alternatives that are as good or nearly as good as the expensive DRM software packages. Give this article a read. If you re unfamiliar with the term DRM, it stands for digital rights management. The record (RIAA), movie (MPAA), and software industry has used forms of DRM to prohibit you from sharing your purchased digital goods with others. This continues to be a headache for the honest, while the less honest folks are able to find free "cracked" version of the same materials.